Keratoconus eye symptoms, causes treatment,surgery ~ healthdaylight help to you improve your health. The Keratoconus is an abnormal disease of the eyes. This disease progresses gradually and then it reaches an abnormal state. This is a problem in the eyes in which the spherical, domed cornea becomes thin and emerges in the shape of angles. This kind of unusual shape prevents the light from entering the eyes from focusing properly on the retina. The cornea is an important part of our eyes, through which light reaches our eyes and we can clearly see anything. The cornea concentrates or changes the light coming in our eyes. During Keratoconus, the size of the cornea changes, which inhibits our vision. Repeating the eyes again causes this disease to occur. Because this disease is fierce, so it should be treated on time. Keratoconus is a disease in which cornea size decreases and it directly impacts our eyes, causing a problem that we do not see clearly. There is some special symptom of this disease. As we get closer vision and distraction problems, due to problems of sight in the night and troubles in seeing the bright light, seeing two things and due to the breaking down of the cornea, due to the gathering of fluid, the sight blurred to get into. At this stage, the middle part of the cornea of the eye spreads and there is trouble in seeing an object clearly. The disease progresses gradually, eventually, it takes a formidable shape. So if any such problem comes to us, we should show our doctor on time. Keratoconus disease can be both infections and genetically. Initially, the effect of Keratoconus disease can be reduced with the help of contact lenses. But with the help of a provision lens, this disease cannot be eliminated. After this, if the problem continues to increase then the patient should use the contact lens to enter the harsh gas. If the eyes feel irritation and soreness, then the eyes should not be rubbed. By doing so, a disease called Keratoconus arises. Therefore, it is necessary to get the test done, then let's check which Keratoconus disease can be overcome by examining it. Corneal topography is an investigation process by which the earliest stage of Keratoconus disease is detected. This investigation process shows Keratoconus disease in the eyes and it can be treated after examination. 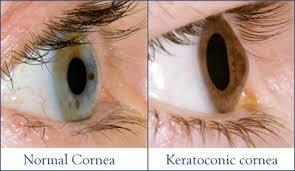 Keratoconus disease can be reduced with the help of corneal transplantation. 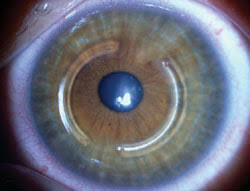 This is a ring cognate made of intake plastic, which is inserted in the central part of the cornea. With this help, to some extent, the complex problem of eyes can be reduced. If the problem increases, additional treatment should be taken. Corneal collagen cross-linking is a modern process by which cornea is transposed into a photosynthesized riboflavin. The process is done in about half an hour UVA light. Collagen crossing with the use of Riboflavin and UVA causes a significant increase in corneal collagen diameter in the eyes. In modern times intrastromal corneal ring is considered a good treatment. This technique is used for patients who do not work in glasses. Intrastromal corneal Ring, Kera Ring, and Intake Prescription Insert. The size of the cornea also decreases or grows due to the increase of Keratoconus. If intrastromal corneal ring treatment is not proven better then its final treatment is cornea transplant. Corneal transplant is considered to be the best treatment. Through it, the Intrastromal corneal ring is made exclusively from the plastic in such a way that it can be easily fitted inside the cornea. In this process, the donor tissue is removed by removing the corneal disc. As well as being a successful treatment, it is very comfortable. With this treatment, cornea retrieves its lost shape and eyes get a good vision.